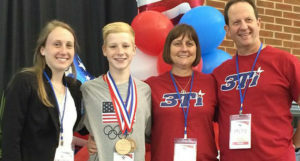 Texas Tumbling and Trampoline Institute (3TI), Inc. is owned by Bill and Lisa Gandy. Our business opened September 1, 2001. We relocated to the present facility in December of 2005. Bill received his coaching degree from Sam Houston State University followed by a Bachelor’s in Physical Therapy at Texas Woman’s University in 1987. When learning how to coach gymnastics at Sam Houston State his instructor was none other than Bela Karolyi! Lisa was a former collegiate gymnast and national floor exercise champion that earned her Master's Degree in Physical Therapy from TWU in 1987 as well. She was the first gymnast inducted into the TWU Athletic Hall of Fame in 1995. Lisa & Bill have both served on the national coaching staff coaching Team USA for USA Gymnastics at the Can-Am Cup, Canada Cup, Pan American Championships & 2 World Age Group Competitions in Russia and Bulgaria. 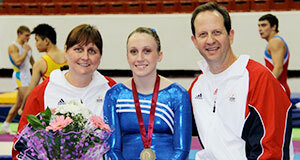 Lisa currently serves as Co-Chair of the USA Gymnastics Trampoline & Tumbling Elite Education Committee. Both Lisa and Bill have a passion in working with children and trying to make a difference in their lives! The Gandy’s have a wealth of experience to draw from as they have 20 National Champions and coached their daughter Sarah through a very successful gymnastics career earning her a classification as an official World Class Gymnast by the Federation of International Gymnastics. In her career, Sarah won 6 national titles, 3 international titles and a bronze medal in the World Age Group Competition and another bronze medal as a member of the Sr. Elite National Team at the World Championships in St. Petersburg, Russia. Since then they have coached 4 others to the elite level earning 3 more international titles and 2 more World Age Group medals.